From what I can guess, I built the catio which was then called the cat-run back about 2001. I don’t think the word “catio” existed then. “Cat-run was the term used. Coyotes ate the next door neighbors cats, leaving the heads and collars as souvenirs. Then they ate their rabbits in the rabbit hutches, and after that, they ate the neighbors flock of geese. I actually saw one goose get taken, but there was nothing I could do. I had several out in the day and in at night cats. I wanted to limit their exposure to danger. 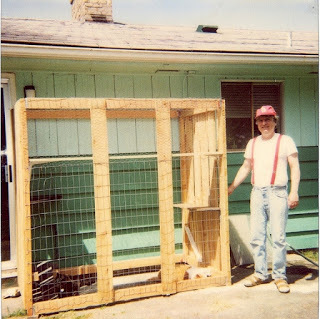 The catio was built of cedar fencing and untreated 2 x 4’s. It is six feet wide, six feet high, and 3 feet deep; or about 2 meter wide, 2 meter high, and 1 meter deep. I used also some wire fencing and chicken wire scraps where I ran short. One secret of the catio is that it has a wheel at the bottom of each of the corners which are against the house. I could pull it away from the house without too much effort. There is no outside door to get into it. I considered an outside door to be a weakness, and possible avenue of escape. In the old house there was a pet door cut into the side of the house which was convenient as an entrance and exit. I also put a board down as a ramp for the older cats to amble down to get inside. Shelves positioned at different levels allow easy jumping from one shelf to the next. The overhang of the eave partially protected it from the weather. That is me in the picture below. In 2006 I sold that house and bought a new house. I thought about abandoning the catio, but in the end, I cut it up into pieces that would fit into my small pickup truck. Fortunately there was a low narrow window available in the new house. I did not fancy cutting a hole into the side of this house! 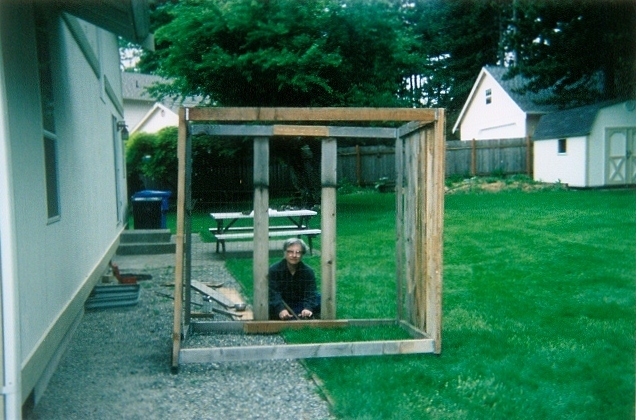 In the next photograph you see me at work assembling the catio. I had cut the catio in two vertically down the middle. I cut the wire vertically from top to bottom in the middle. I was wiring it together in the photograph. It went pretty quickly. The cats (Not the cats I have today–they have all passed on) were glad to use it again. There was a much better view at this house! 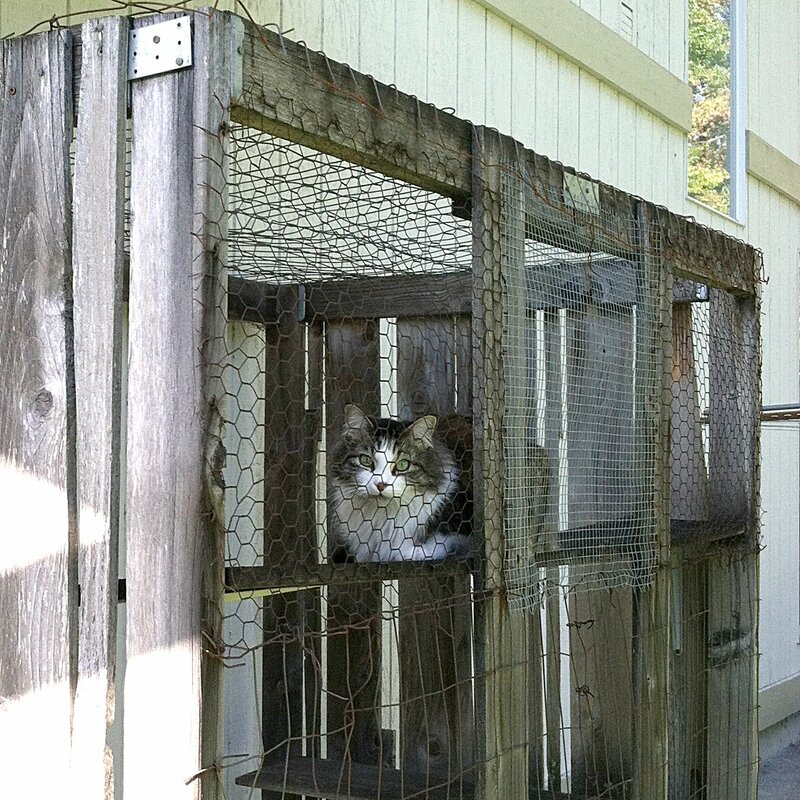 Looking at the catio today, it looks like it has seen better days. When I go past it, I often check to make certain it is sturdy. It looks rough, but the cedar fencing nailed on the sides, and the wire fencing nailed to the frame give it strength. It is a very happy place in spite of it’s appearance. I have made some repairs. These are some much-loved cats. It makes me happy to read about them. Glad you like them. Repairs are being now made to the catio, and it is not looking so weather-worn as in these photos. When I am done, I will take a new snap. Ich liebe das Catio, so kann deinen Samtpfoten nichts passieren und sie können die frische Luft genießen. Kein Wunder dass sie es lieben. That is so sad that all the neighbors’ cats got killed by coyotes at your other house. Your kitties are lucky you took the time to build this and then reassemble it at your new house. I love that you’ve had a catio for so many years. Your cats are very lucky. The catio is a wonderful idea to keep your cats safe. Otis has our enclosed front porch to go out in, which is screened. He loves to go out in it and watch the chipmunks and birds. I would never let him outdoors without this kind of protection, since there are racoons and even hawks outside that could harm him. Your cats look like they’re in Heaven whenever they’re out in the catio! I’m glad you love your cats and are willing to do this for them. I’m sure they do love it!